A campus network is a building or group of buildings all connected into one enterprise network that consists of many local-area networks (LANs). A campus is generally a portion of a company (or the whole company) that is constrained to a fixed geographic area. The distinct characteristic of a campus environment is that the company that owns the campus network usually owns the physical wires deployed in the campus. The campus network topology is primarily LAN technology connecting all the end systems within the building. Campus networks generally use LAN technologies, such as Ethernet, Token Ring, Fiber Distributed Data Interface (FDDI), Fast Ethernet, Gigabit Ethernet, and Asynchronous Transfer Mode (ATM). The Enterprise Composite Network Model. As shown in the follow figure. A large campus with groups of buildings can also use WAN technology to connect the buildings. Although the wiring and protocols of a campus might be based on WAN technology, they do not share the WAN constraint of the high cost of bandwidth. After the wire is installed, bandwidth is inexpensive because the company owns the wires and there is no recurring cost to a service provider. However, upgrading the physical wiring can be expensive. Consequently, network designers generally deploy a campus design optimized for the fastest functional architecture that runs on the existing physical wire. They might also upgrade wiring to meet the requirements of emerging applications. For example, higher-speed technologies-such as Fast Ethernet, Gigabit Ethernet, and ATM as a backbone architecture-and Layer 2 switching provide dedicated bandwidth to the desktop. The Enterprise Composite Network Model is a blueprint that network designers can use to simplify the complexity of a large internetwork. The blueprint lets you apply a modular, hierarchical approach to network design. With the Enterprise Composite Network Model, you can analyze the functional, logical, and physical components of a network, and thus simplify the process of designing an overall enterprise network. Enterprise campus. The enterprise campus includes the modules required to build a robust campus network that provides high availability, scalability and flexibility. This area contains all the network elements for independent operation within one campus location. An enterprise can have more than one campus. Enterprise edge. The enterprise edge aggregates the connectivity from the various elements at the edge of an enterprise network. The enterprise edge functional area filters traffic from the edge modules and routes it into the enterprise campus. The enterprise edge contains all the network elements for efficient and secure communication between the enterprise campus and remote locations, business partners, mobile users and the Internet. In the past, network designers had only a limited number of hardware options - routers or hubs - when purchasing a technology for their campus networks. Consequently, it was rare to make a hardware design mistake. Hubs were for wiring closets, and routers were for the data-center or main telecommunications operations. Recently, local-area networking has been revolutionized by the exploding use of LAN switching at Layer 2 (the data link layer) to increase performance and to provide more bandwidth to meet new data networking applications. LAN switches provide this performance benefit by increasing bandwidth and throughput for workgroups and local servers. 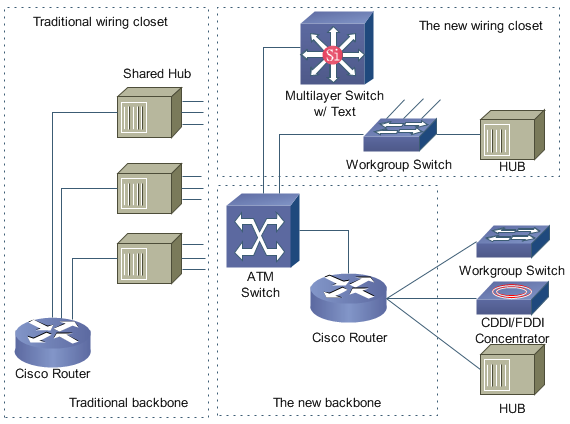 Network designers are deploying LAN switches out toward the network's edge in wiring closets. These switches are usually installed to replace shared concentrator hubs and give higher-bandwidth connections to the end user. Layer 3 networking is required in the network to interconnect the switched workgroups and to provide services that include security, quality of service (QoS), and traffic management. Routing integrates these switched networks, and provides the security, stability, and control needed to build functional and scalable networks. Traditionally, Layer 2 switching has been provided by LAN switches, and Layer 3 networking has been provided by routers. Increasingly, these two networking functions are being integrated into common platforms. Multilayer switches that provide Layer 2 and 3 functionality, for example, are now appearing in the marketplace. With the advent of such technologies as Layer 3 switching, LAN switching, and virtual LANs (VLANs), building campus networks is becoming more complex than in the past. Table 1-1 summarizes the various LAN technologies required to build successful campus networks. Cisco Systems offers product solutions in all these technologies. Network designers are now designing campus networks by purchasing separate equipment types (for example, routers, Ethernet switches, and ATM switches) and then linking them. Although individual purchase decisions might seem harmless, network designers must not forget that this separate equipment still works together to form a network. Use Layer 2, Layer 3, or ATM backbone solutions to expand your large campus network. In typical designs, the buildings or different parts of the campus connect together across a high performance, switched backbone. Network redundancy and high availability is provided at each layer. A high capacity, centralized server farm provides resources to the campus, and when combined with Cisco IOS, network management strategies support QoS, security, troubleshooting, and other common management features from end to end. Support for applications based on Novell IPX, DECnet, AppleTalk, and SNA Based on the Cisco AVVID architecture, these intelligent network platforms and products provide the basis for a complete network solution. This Cisco solution provides manageable switched infrastructure for a campus intranet with over a thousand networked devices. The high performance collapsed backbone uses layer three switching. Network redundancy are provided to clients and servers. Hot Standby Routing Protocol (HSRP) provides fast recovery of link failures. Cisco IOS supports QoS, security, troubleshooting, and common management features from end to end. The Cisco solution provides high-performance switched infrastructure for a building-sized intranet with hundreds of networked devices. The network backbone consists of a L3 switch. Access layer switches provide connectivity to clients and servers. Cisco IOS software supports QoS, security, troubleshooting, and common management features from end to end. Campus network design topologies should meet a customer's goals for availability and performance by featuring small bandwidth domains, small broadcast domains, redundancy, mirrored servers, and multiple ways for a workstation to reach a router for off-net communications. Campus networks should be designed using a hierarchical, modular approach so that the network offers good performance, maintainability, and scalability. Most campus networks feature a high-performance, switched backbone, called the campus backbone, that connects buildings and different parts of the campus. A high-capacity, centralized server farm connects to the backbone and provides internal server resources to users, for example, application, file, print, e-mail, and Domain Name System (DNS) services. Network management is an important component in a campus network design. A campus backbone must provide access to management devices that support monitoring, logging, troubleshooting, security, and other common management functions. Building access submodule. Located within a campus building, this submodule contains end-user workstations and IP phones connected to switches or wireless access points. Higher-end switches provide uplinks to the building distribution module. Services offered by this module include network access, broadcast control, protocol filtering, and the marking of packets for QoS features. Building distribution submodule. The job of this submodule is to aggregate wiring closets within a building and provide connectivity to the campus backbone via routers (or switches with routing modules). This submodule provides routing, QoS, and access control methods for meeting security and performance requirements. Redundancy and load sharing are recommended for this submodule. For example, each building distribution submodule should have two equal-cost paths to the campus backbone. Campus backbone. The campus backbone is the core layer of the campus infrastructure. The backbone interconnects the building access and distribute submodules with the server farm, network management, and edge distribution modules. The campus backbone provides redundant and fast-converging connectivity. It routes and switches traffic as quickly as possible from one module to another. This module usually uses high-speed routers (or switches with routing capability) and provides QoS and security features.